Canon 5D "X" being announced at CP+? Full-frame SLR to be unveiled soon? 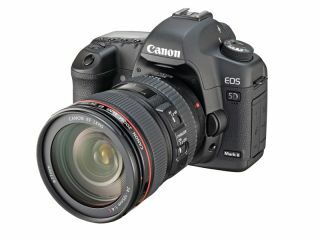 Could a 5D Mark II replacement be as close as February 7th? Rumours are circulating that Canon is poised to announce a new 5D just before the CP+ photography trade show in Japan. It seems more and more likely as the days go on that CP+ is going to be a bigger deal than it has been in previous years, with several camera manufacturers said to be announcing big things at the annual show, and the Japanese keen to give their own show precedence over the likes of CES and Photokina. The latest from the rumour mill is that Canon will be announcing a successor to its 5D full-frame camera, with some suggestion it could be a replacement for both the 5D Mark II and the APS-C sensored 7D. Several rumoured specs of the new camera have been doing the rounds for months now, but those include a 21 or 22 million pixel sensor, a "pro level" autofocus system and a new button layout. Rumours have usually suggested that the camera could be called the 5D Mark III, or 6D, but lately, the idea that it will be called the 5D X has been mentioned, this would make sense if Canon wanted to follow the same naming convention of its recently announced 1DX and G1 X cameras. But now, we also have a rumoured announcement date, with February 7th falling into the frame. This is the same day as the Nikon D800 is rumoured to be announced, while Olympus is also said to have something big planned for the 8th. Nikon waited until January to announce its Canon 1DX rival in the form of the Nikon D4, but will make the camera available on the market earlier. At the time of the 1DX announcement, back in October, Canon confirmed it was working on a new full-frame model, but kept tight-lipped about the details and its name. CP+ takes place from the 9th-12th of February, so it would make sense for the big names at the show to have something new and exciting to show off at the event.